One of the key features that many ebikes allow is a throttle without the need for pedaling. This means that you can push a lever and ride your bicycle without pedaling. You can engage the electric motor by twist throttles or thumb throttles. There are a few situations where you'd want this feature. 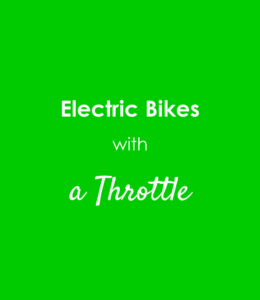 Learn more about ebikes with a throttle. Magnum Premium 48, a folding ebike, has a trigger throttle. On a long recreational ride or a road ride, there's going to be times when you get really tired and you don't want to pedal. Maybe you're feeling ill. Maybe it's the end of a long day. You may be miles away from your car or home. On a conventional bike, you've got to dig in and keep pedaling. But with a pedal-free throttle power bike, you can get back home and rest. Sometimes it's just fun to cruise. Sometimes you want to go really fast, or jump rocks, and you just don't want to be distracted by the effort necessary when pedaling. You're going to drain your battery pretty quickly when you use the throttle. So you want to be judicious about when you use this awesome function. There are a few different types of e bike that will have throttles. Many of our e bikes either come with a throttle or a throttle can be added. Our master technicians at High Country E Bikes will add a throttle for $85 (must be throttle compatible).